Is this rusty bollard safe for bicyclists? Recently I sent a letter to GCC with some complaints about NCR75. To their credit, they appear to have acted on at least some of that letter (with thanks to Alison Thewliss for raising my letter with GCC LES) – they seem to clean the previously glass-strewn path a lot more often now, and they may have put up more signs to show which paths are meant to be shared-use. At the Broomielaw, National Cycle Route 75 is located on the north side of the Casino, using a shared use pedestrian/ cycle track. 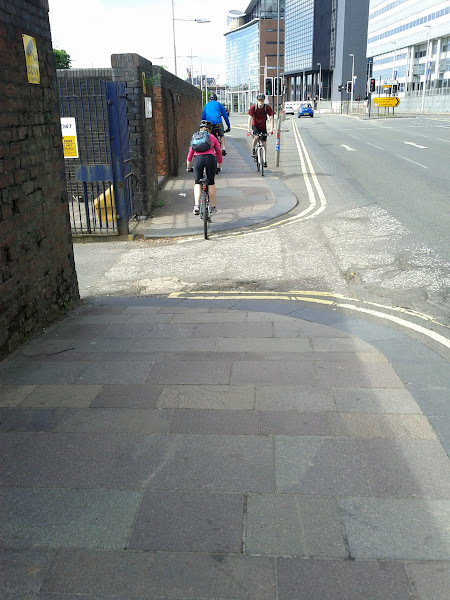 Drivers exiting the Clydeport car park have poor sightlines, hence the kerbs nearest the wall on the cycle track have not been dropped, thus encouraging cyclists to stay away from this area, where they are harder to see. Now, bear in mind this is an almost unused car-park – I’ve never seen a car going in or out there, even though I commute past there every morning and evening. The cycle-path there on the other hand is heavily used. Further, the kerb, though lower toward the outside, is still a raised kerb and an impediment to cycling! Never mind the road surface is also broken up to at least one side. So the message is, when it comes down to the convenience of a large number of cyclists, versus that of a property holding company and its under-utilised, city centre car park for a couple of employees, well the cyclists can more or less go and get stuffed. Update: Went past the Clydeport car-park later in the day today and it does seem full. Entrance to the Clydeport car-park on the Broomielaw, with the National Cycle Route 75 crossing it. The cycle-path has a dropped kerb, very inconvenient for cyclists, particularly any carrying luggarge, and any on normal, non-offroad bikes. Note the cyclists having to stand up to negotiate the kerbs, even though they are out from entrance. Still looks like urban mountain-biking, sadly. Another view of the car park entrance. Note that cars actually have plenty of visibility to this direction. It is only the wall on the other side that is impeding visibility. Note also the broken surface of the road, making the far kerb even harder to negotiate. 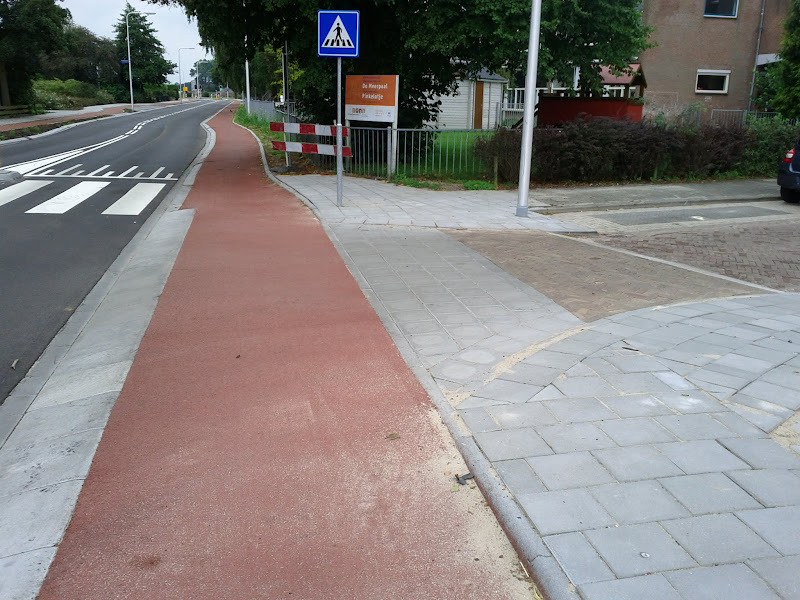 It is actually quite possible to engineer minor side-streets and entrances that must cross cycle-paths so that cyclists progress and safety is not compromised. They manage it all the time in the Netherlands. The line-of-sight issue could be better resolved by modifying the wall, and/or installing a lowish, progressive projection/kerb around the entrance wall to ensure cyclists move further out (indeed, this would be a good idea either way). Further, it should be Clydeports’ responsibility to ensure that its property does not impose undue risks on the passing public. At least, I would hope there is legislation and/or by-laws in place, to that effect. So how do the dutch do it? 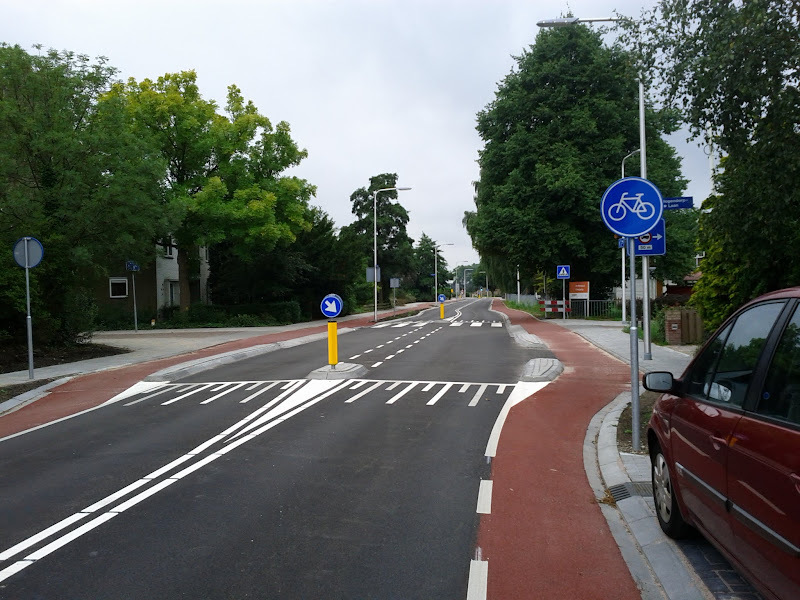 Dutch cycle-lane, with a minor-side-street junction. The junction is engineered to safely allow cyclists on the busier street the right of way over the quieter joining entrances. Note the conspicuous signage to remind drivers of the cycle lane, and note the concrete segregation barriers immediately before the junction, to prevent car drivers from turning in fast and early. Note how the road is further engineered to slow down any cars before they cross the cycle lane, and so reduce conflicts. The cycle lane is raised up slightly with a smooth gradient, while the roads have a steeper kerb to negotiate, to force them to slow down and further help make them aware of the cycle lane. Glasgow city cycling infrastructure, only for mountain bikers? Glasgow City Council plan over the next few years to build new segregated cycling paths across the city. This is amazingly welcome news, of course. Work is already underway on a segregated path from Saltmarket, down London Rd towards the East End (to the under-construction velodrom perhaps?). Unfortunately, whether through lack of cash or lack of co-ordination and/or sheer institutional inexperience with building cycling infrastructure, the infrastructure that exists often comes with design and maintenance faults. At least, faults that would be immediately obvious to any regular cyclist. Unfortunately, the new segregated paths, though not yet finished, seem to suffer the same problem of some other such existing cycle paths in Glasgow: You need a mountain bike to use them! On monday morning, the 6th of June, while cycling along the cycle-path along the clyde, from Victoria Bridge to the George IV Bridge, I noticed a significant amount of glass near the Victoria Bridge end – no doubt from weekend drinking. The shards were large, and I warned cyclists coming in the opposite direction. Unfortunately, I did not report it to the council myself – I naively presumed someone else would have and/or that the council would clean the cycle path daily. This morning, Tuesday the 6th, the glass at that location had been mashed into finer pieces and spread everywhere (no doubt in part by unfortunate cyclists). My rear tyre was punctured by this glass, and I know at least 2 other cyclists received punctures. This is the 2nd time I’ve had a puncture on that stretch of cycle-path, in only a few months of cycling it (2/3 of all my punctures). I would ask that you clean this cycle path today. Generally, I would ask you to clean it and all others preferably daily, or failing that on at least the same schedule as the main roads, or failing that to at least on Monday mornings clear the path of the debris from weekend drinkers. Additionally, I intend to recover from you the costs of a new inner tube (£5), tyre (£29) and the labour to have them fitted. Another maintenance issue is that one of the poles at the entrance of the side-street alongside the Broomielaw, by the Gala Riverboat car-park, has a piece of metal sticking out at the top of it which is likely one of these days to catch and injure a cyclist trying to enter that side-street. Also, I have some general comments to make about cycle paths in Glasgow City on their design and maintenance. * It can be very hard to distinguish which paths are dual-use and which are not, due to poor signage and/or very poor cycle-path design. E.g. the toucan crossing at George IV bridge going west to the Gala Riverboat appears to lead cyclists onto a foot-path – at least it has a raised kerb to the entrance to the car-park which seems to clearly suggest that path is not intended for cycling. However, if it is not meant to be a cycle-path, then the toucan crossing to that path is encouraging cyclists to proceed down it and so commit an offence. On the other hand, if it is still a cycle-path, then why are there raised kerbs along it? Clear signage here, either way, would be useful. Removing the kerbs and making this cycle path continuous would be an idea, if it is a cycle-path. If the kerbs are intended to make cyclists give way to the car-path traffic, I would suggest reversing things and raising the cycle-path so it is level and giving cars a gradient to traverse and give way to a clearly marked cycle/footpath (there are few cars using this car-park in the morning). If a cycle path is not easy to distinguish, then some cyclists will stick to the general road – to ensure they do not commit the offence of cycling on the pavement. If a cycle path is inconvenient, they will similarly stick to the road. * Cycle paths away from the road need to be cleaned frequently. E.g. the path along the Clyde mentioned above is regularly filled with broken glass from beer and Buckfast bottles. It’s particularly bad underneath the foot-bridge over the clyde – drinkers presumably congregate under there for shelter. It needs frequent cleaning in order to be useful as a cycle-path. If the means do not exist for the council to do this, then the council should installs signs directing cyclists along Clyde St road instead and create a cycle lane on Clyde St road. It should be noted this same cycle-path (National Cycle Route 75) is also terribly glass-filled along many sections further up-river, such as around Dalmarnock and Carmyle. Parts of the cycle lane on Alderman St are quite debris filled, particularly in those parts where there are dividers between the general road and the cycle lane. If cycle-paths are full of glass, but the roads are not (cars have a cleaning effect & roads seem to be cleaned more regularly), then clearly cyclists will be encouraged to favour roads over cycle-paths. * Cycle lanes need to have their surface maintained equally as well as the general road surface. 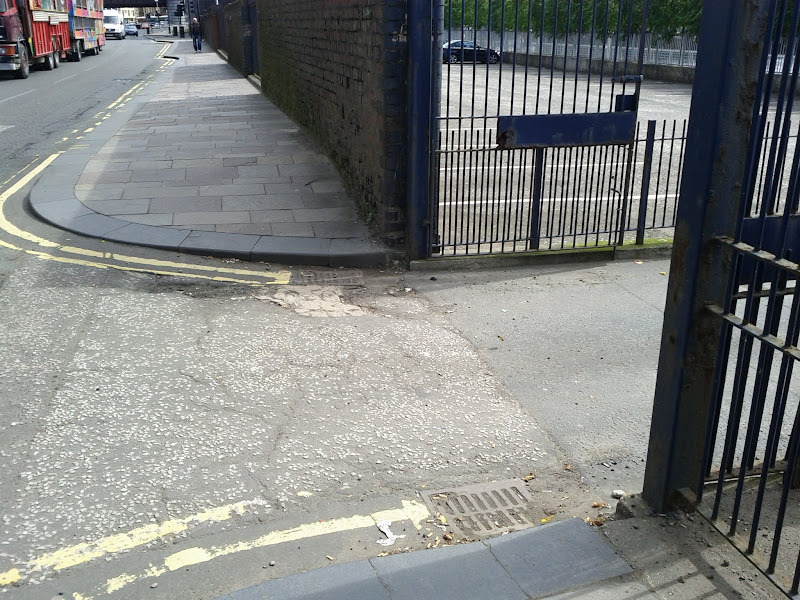 There are many places in Glasgow where the condition of the surface of on-road cycle lanes is terribly poor. Incredibly, in some cases the general road has clearly had some resurfacing work done to it while the cycle lane has NOT – as the road surface is quite different between them (e.g. parts of Kelso St). Poor cycle lane surfaces cause cyclists to have to cycle out on the general road surface for their comfort, to make progress and for their safety. * Cycle lanes should be designed to be convenient, without arbitrary sharp turns or deliberately rough surfaces. Taking just the NCR 75 in the city as an example, there are several places where the cyclist must make sharp turns. E.g. to rejoin it just after Victoria Bridge, the cyclist must make a sharp turn and go over cobble – the gate that would allow the cyclist to avoid the cobbles is always closed. Next, at the relatively modern underpass for the Glasgow Bridge at Bridge St, there is a very sharp turn at each end and a ridiculous requirement for cyclists to dismount. This section could easily have been designed with a progressive bend on and off the underpass, and the underpass could have been made wider. Further along, where it goes under the M8, there are again sharp turns. Having to scrub hard-gained momentum because of poorly designed facilities is incredibly frustrating for cyclists. The roads alongside NCR75 seem to manage to stay fairly straight along the same course, increasing the attractiveness of the road to some cyclists. In summary: Capital expenditure on cycling infrastructure can be wasted, if that infrastructure is not maintained at least as well as the roads, discouraging cyclists from using them. Such capital expenditure is further wasted if its very design incorporates inconveniences to the cyclist (be it deliberately, in order to artificially force cyclists to give way to cars, or unintentionally because the designer simply is not a cyclist). Such issues may cause cyclists to ignore the infrastructure and use the general road instead – risking the wrath of the occasional motor-vehicle driver who considers the road to be solely theirs. I would ask you to continue to invest further in cycling infrastructure, to encourage Glaswegians to take more to their bikes. The benefits of cycling to public health & traffic congestion would make such investment cheap in the long-run.